A cold and the flu are viral infections. They both affect your respiratory system. This includes your throat, nose, airway and lungs. It is difficult to tell the two apart. The flu is generally worse than a cold. It is common to get a cold more than once a year. Most people get the flu only a few times every 10 years. A cold and the flu have similar symptoms. However, they are two different conditions. One particular type of flu is considered serious. It is called H1N1 flu. Some people call it swine flu. It is a respiratory infection. It is caused by a virus found in pigs. It can infect humans. Its symptoms are similar to other flu symptoms. Cold and flu symptoms can last between 2 and 14 days. Viruses cause colds and the flu. More than 200 different viruses can cause colds. Not as many viruses cause the flu. That’s why there’s a vaccine available for the flu and not for colds. There is no test to diagnose a cold. Your doctor will ask you about your symptoms and suggest treating the symptoms. If your doctor suspects you have the flu, he or she may test you. The test involves swabbing the inside of your nose or back of your throat. Results are available fairly quickly. 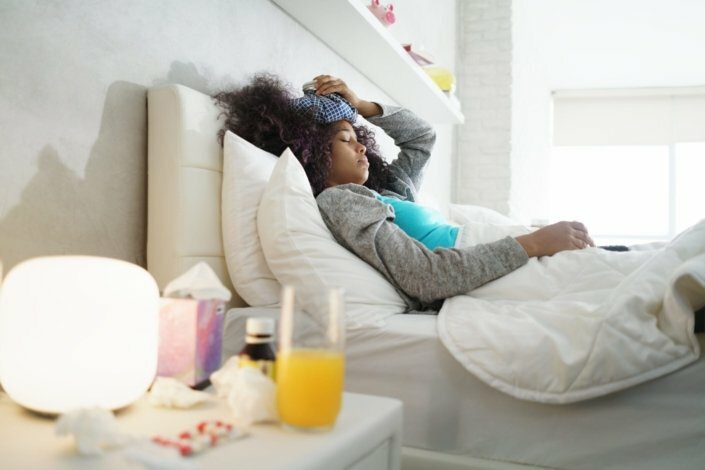 Can a cold or flu be prevented or avoided? Wash your hands frequently. Use soap. This stops the spread of germs. Eat healthy, exercise, and get enough sleep. These things boost your immune system. Cough and sneeze into the inside of your elbow (not your hands). Clean common surfaces, such as tables, counters, toys, door handles and bathrooms. Use anti-bacterial disinfectants. Get a flu vaccine (shot or nasal spray). It is available through flu season. The best time is October and November. The flu shot is safe for adults and all children 6 months of age and older. It is strongly recommended that all children 6 months of age to 59 months of age get a yearly flu shot. The nasal-spray vaccine contains live but weakened viruses. It is safe for adults and all children 2 years of age and older who do not have asthma or breathing problems. Talk to your doctor before getting the nasal spray vaccine. You cannot get the flu from the flu shot or the nasal-spray vaccine. Some people who get the vaccine will still get the flu. They usually get a milder case than people who aren’t vaccinated. The vaccine is recommended for people who are more likely to get really sick from flu-related complications. There’s no cure for the common cold or the flu. Antibiotics do not work against the viruses that cause colds and the flu. The illness has to run its course. You can do some things to ease your symptoms. For a low fever, mild aches, and pains, take products such as acetaminophen (one brand: Tylenol), naproxen (one brand: Aleve) or ibuprofen (one brand: Advil). Drink plenty of fluids. Get as much sleep as you can. Stay home to avoid spreading germs to others. Your doctor may prescribe an antiviral medicine for the flu. This only shortens the length of time you are sick. These medicines come as pills, syrup or in an inhaler. The inhaled type may cause problems for some people who have asthma or chronic obstructive pulmonary disease (COPD). Some antiviral medicines can cause nausea and vomiting. When easing a child’s symptoms, acetaminophen (one brand: Children’s Tylenol) can help ease pain and lower a fever. Be sure you are giving your child the correct dose according to his or her age and weight. Nasal sprays and decongestants are not recommended for young children. They may cause side effects. Cough and cold medicines are not recommended for children. This is especially true for those younger than 2. There is little evidence that cough and cold medicines and nasal decongestants are effective in treating children. To treat your child’s cold or the flu, make sure that your child rests. Give him or her plenty of fluids. Use a humidifier to moisten the air in your child’s bedroom. This will help with nasal congestion. Use a saline nasal spray to thin nasal mucus. Use a bulb syringe to suction mucus out of your baby or child’s nose. Cold and flu symptoms are uncomfortable. You will not feel well for the time it takes your cold and flu to run its course. Ease your symptoms with rest, fluids, over-the-counter medicine, and blowing your nose. How long will my cold or flu symptoms last? How long should I or my child stay home? Do all cold and flu medicines require prescriptions? Can I get the flu vaccine while I’m sick? Is the vaccine effective after I’ve had the flu? I’m pregnant. Is there danger to my baby from the flu?